The following testing procedure should be printed and marked for debugging and record keeping. *Assign a name and a I2C address to your board. The name and address will be stored at a later stage in the micro-controller. 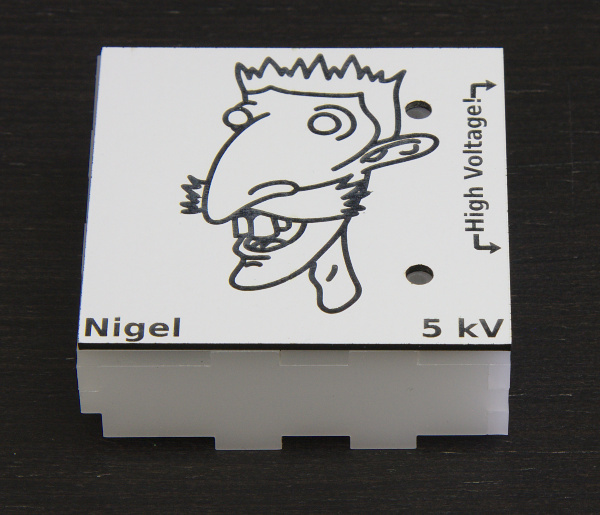 The name helps differentiate different HVPSs, and because they all have their own personality, and maximal voltage, we like to give them a distinctive name. The I2C address is used if you want to assemble several HVPS into a multi-channel high-voltage power supply (MHVPS). Valid addresses are between 10 and 127. Check all the resistor values. 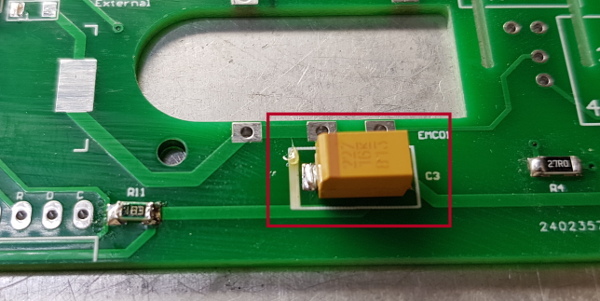 Place a tick in the box if the marking on the resistor matches the value below. Check the polarity of the components below. 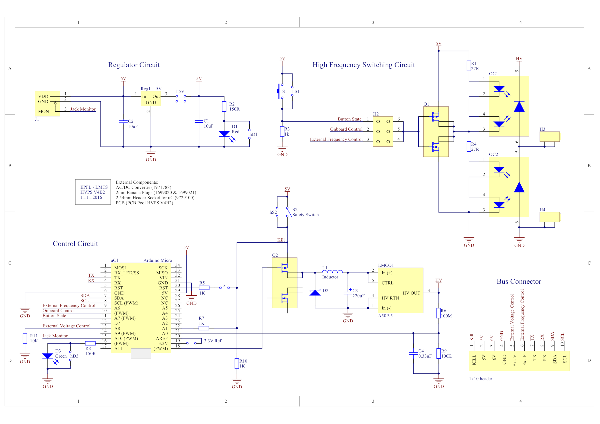 Place a tick in the box if the polarity matches the polarity on the PCB overlay. 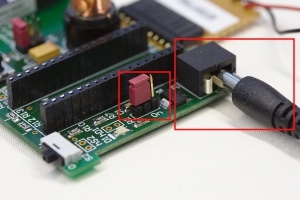 Measure the resistance between the 5V rail and GND. 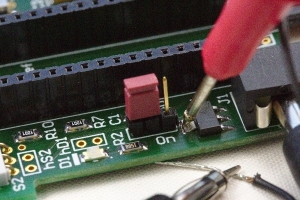 How to conduct test: Use the rail board to make a connection to the 5V and ground rails using the 10-pins connector and measure the resistance with a multimeter. 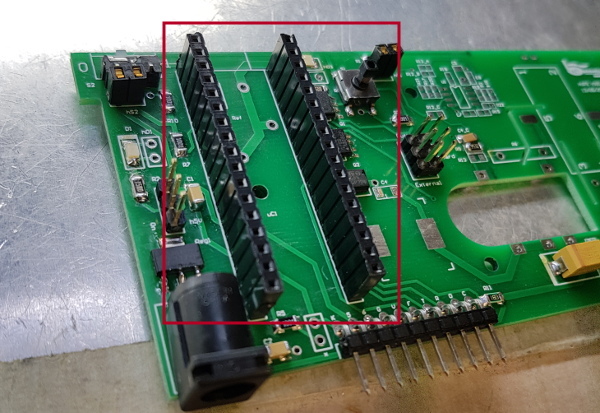 (If you need to build your own rail board, solder a red wire to pin 2 (5V) and a black wire to pin 4 (GND), as shown on picture below.) The switch s2 must be in position 0. Purpose of test: To determine if there are any shorts between the power rails before applying power. 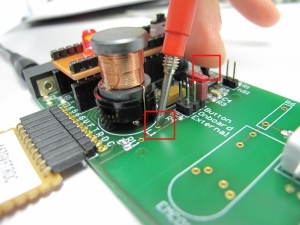 Measure the output of the 5V regulator. b) Plug in the 7.5V adapter. c) Measure the voltage of the regulator relative to ground. 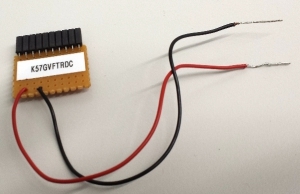 The easiest way to do this is to use the rail board from the last step to connect to ground and to probe the large tab of Reg1 with a multimeter probe. Record the voltage below. Purpose of test: To determine if the regulator is functioning correctly without the remainder of the circuit connected. Test if the circuit has power. c) If LED D1 glows green, place a tick the check box and continue. If not, remove the jumper and investigate for a cause. Purpose of test: To determine if there are any components which are consuming too much power due to assembly errors or faulty components. a) Insert the dummy microcontroller. 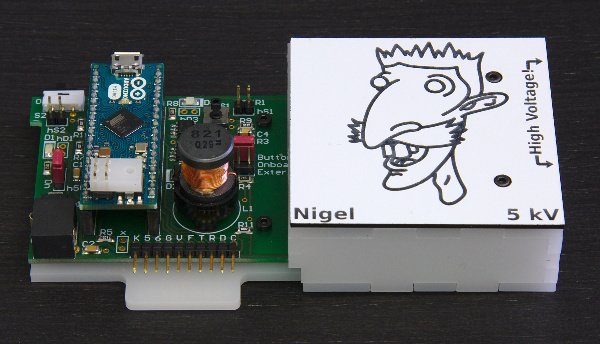 The dummy microncontroller is a small board which imitates the functions of the arduino micro. 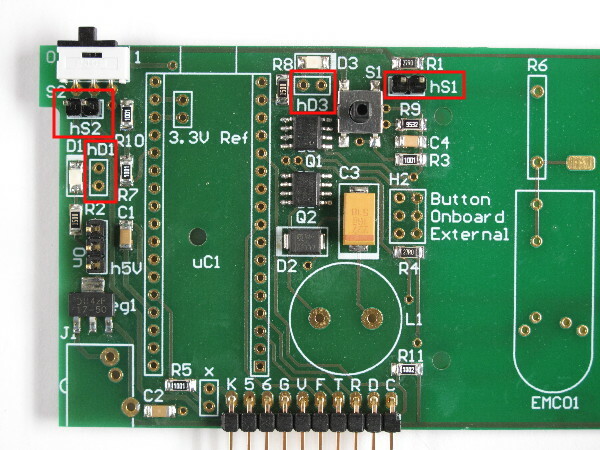 b) Ensure that the switch on the dummy microcontroller is in the ‘D3 test’ position. 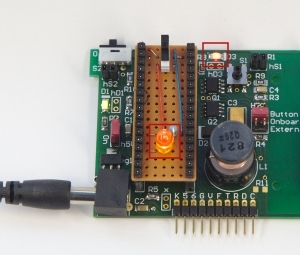 c) Observe the LED on the dummy microcontroller. If the LED glows orange, place a tick in the box below. If not, remove the power jumper (h5v) and check for a cause. d) Observe LED D3. If LED D3 glows red, place a tick in the box below. If not, remove the power jumper (h5v) and check the polarity of LED D3. 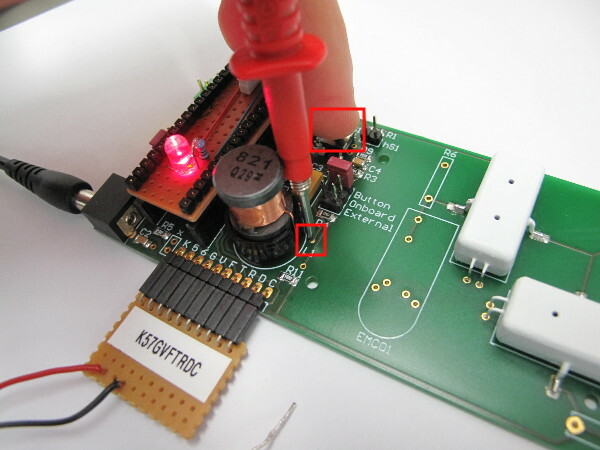 Purpose of test: Step c) tests whether the power pins on the microcontroller are connected to power. Step d) tests if the HV indicator LED is functional. a) Place a jumper on H2 in the ‘Button’ position. 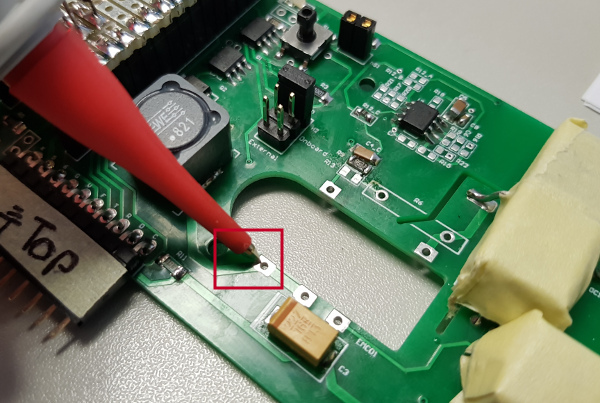 b) Connect the COM port of the multimeter to the GND wire of the rail board. c) Using a probe measure the voltage of the via close to R4. Record the voltage when S1 is depressed and when pressed. Purpose of test: This test measures the output from Q1. 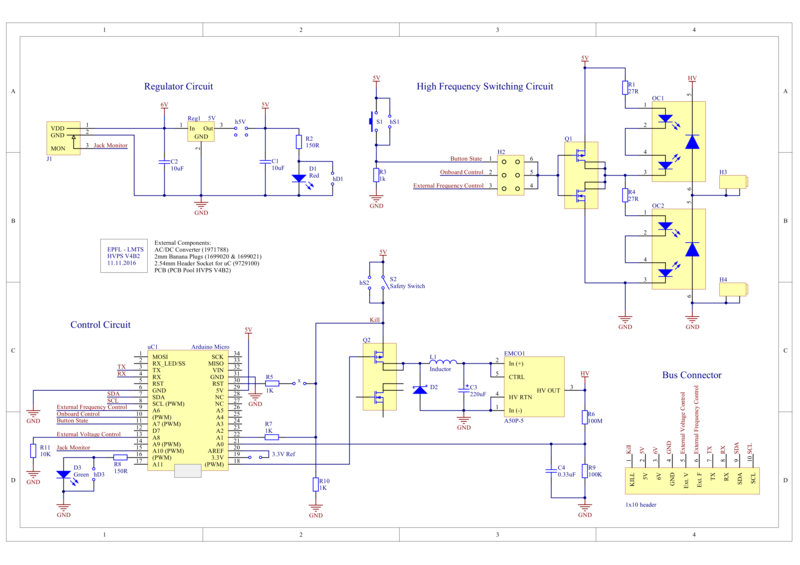 The voltage must toggle from rail to rail to turn the infrared LEDs on and off. 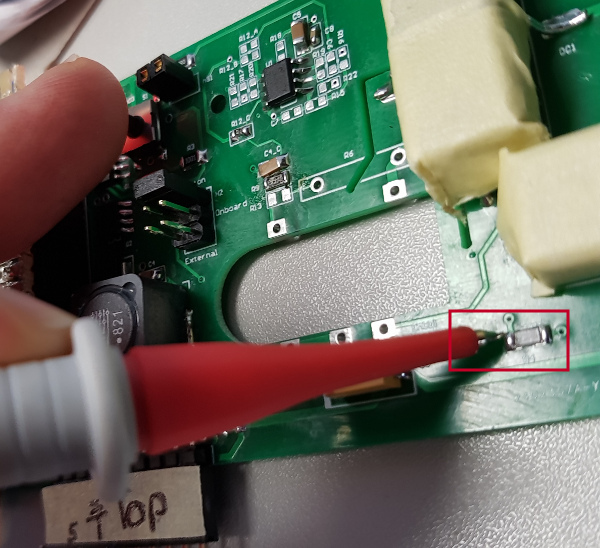 b) Ensure that the COM port of the multimeter is still connected to the GND wire of the rail board. 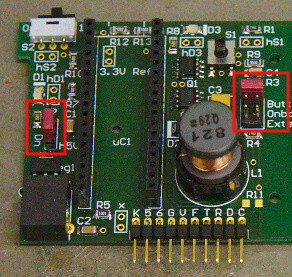 d) Using a probe measure the voltage on pin pair 2-5 (see picture) and record the value below. f) Using a probe measure the voltage on pin pair 2-5 (see picture) and record the value below. 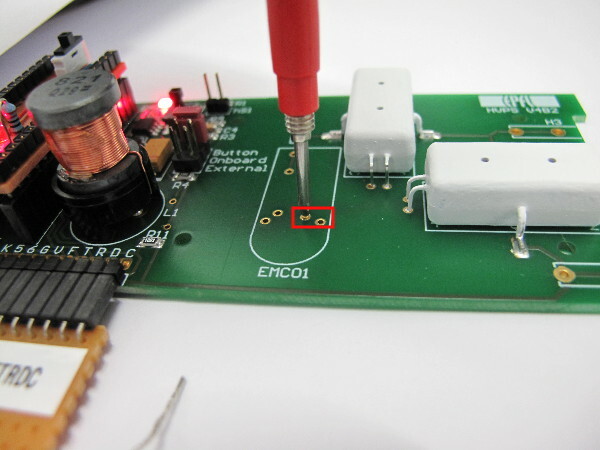 Purpose of test: To test if the circuit providing power to the EMCO is able to provide 5V. 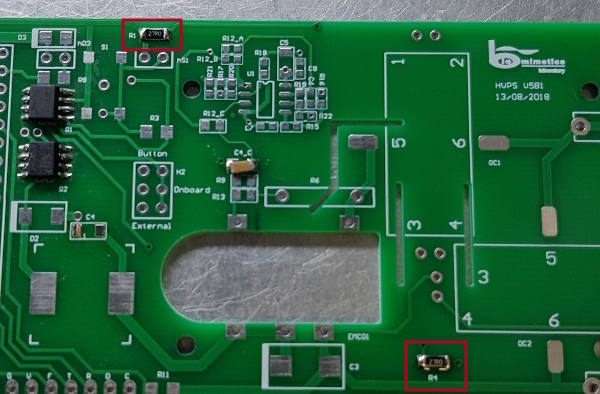 If your HVPS has passed all the low voltage tests above (all check boxes ticked), you can continue with the soldering of the high voltage components (section 4 of the assembly page). 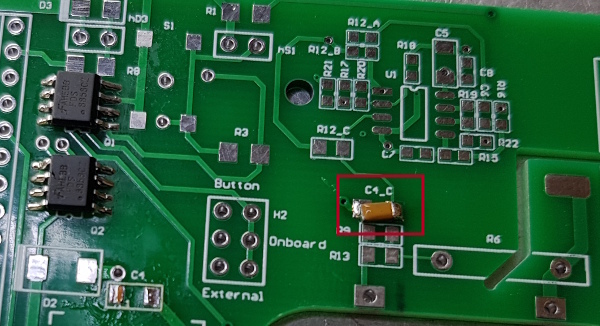 Take a PCB and clean it with isopropyl alcohol. Wear gloves during assembly. Solder dual MOSFETs Q1 and Q2. Make sure that the notch on the chip is aligned with the notch on the PCB overlay. Solder capacitors C1, C2, C5, and C9. Polarity is not important. Solder capacitors C8. Polarity is not important. Solder capacitor C4_c. Polarity is not important. Solder the resistors R1 and R4. Polarity is not important. Solder resistors R2 and R8. Polarity is not important. Solder resistors R3, R5, R7, and R10. The value of R9 depends on the output voltage of the HVPS. Please select the appropriate value below. 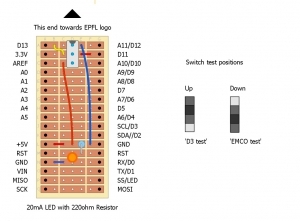 More details on the design of the voltage divider and the resistance values. 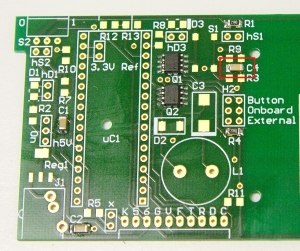 Solder D1 (Green). Note the polarity! 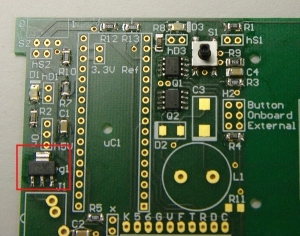 The green markings on top of the LED should face the thick line on the PCB overlay. 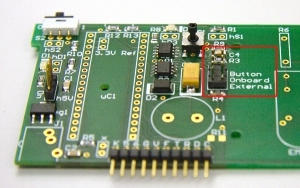 Solder D3 (Red). Note the polarity! 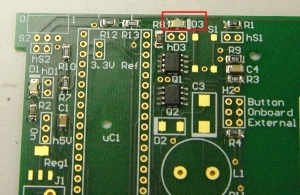 The green markings on top of the LED should face the thick line on the PCB overlay. Solder D2. Note the polarity! The line on the diode should match the line on the PCB overlay. Solder C3. Note the polarity! 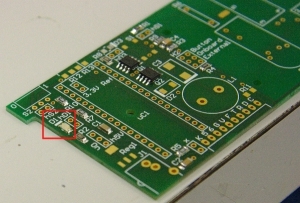 The line on the diode should match the marking on the PCB overlay. Solder L1. Polarity is not important. Solder edge connector K56GVFTRDC. The edge connector is supplied in long strips. 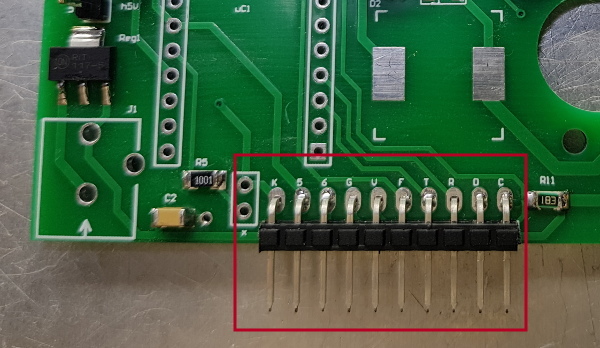 Using a pair of pliers break off a row of 10 pins. Solder h5V. Polarity is not important. Solder hD1, hD3, hS1, hS2 if you intend to have components D1, D3, S1, S2 panel mounted. Polarity for these headers is not important. 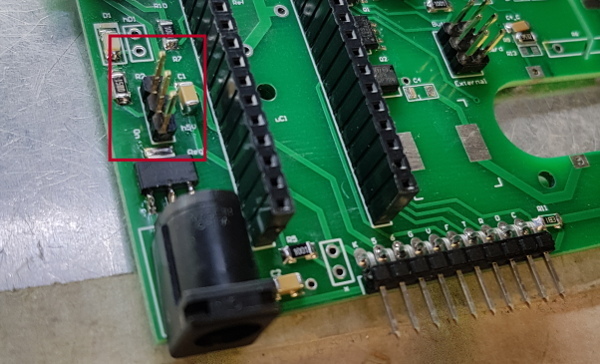 If you intend to place the board in the minimalistic enclosure, soldering these headers is not necessary. 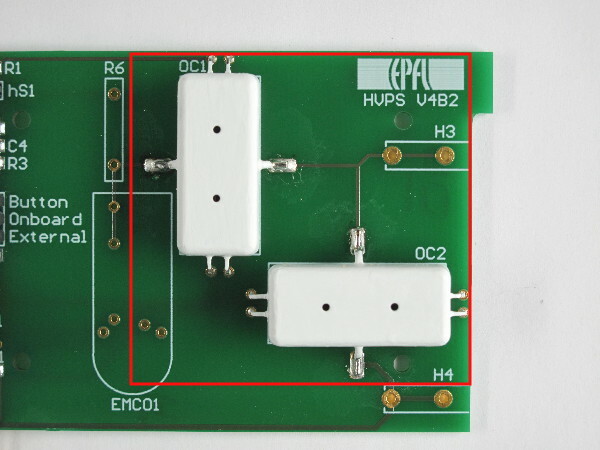 If you intend to place the board in the full enclosure, only headers hS1 and hS2 are necessary. Solder H2. Polarity is not important. Solder header sockets for microcontroller. The header sockets are supplied in long strips. Score the plastic with a craft knife and break off 17 contacts with a pair of pliers. Clean up the rough edge with the craft knife or sandpaper. Bend the leads as shown in the series of images below. Bend the tip of pin 1 so that it can be identified after painting the optocoupler. The optocoupler is painted to prevent inteference from neighbouring optocouplers and IR light which is present in the environment. Tipp-Ex is used because it creates a relatively good barrier to IR light and is easy to apply. 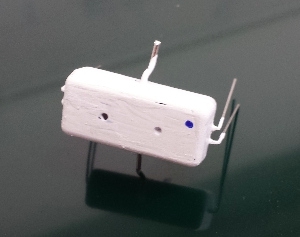 Simply paint the plastic body of the optocoupler with a single layer of Tipp-Ex and let it dry. It is best to do it rapidly and in single strokes. Making multiple passes results in a sticky mess which is very unsightly. Use a permanent pen to mark pin 1 with a dot next to the pin. Solder optocouplers OC1 and OC2. Make sure that the polarity is correct. Place the jumper on h5V in the ON position, and the jumper h2 in the Button position. Before assembling the High-voltage components, go through the low-voltage testing procedure and ensure that the circuit is working properly. Only proceed with the assembly of the HV components if all the low voltage tests have passed. Solder R6. Do not fully insert this resistor. 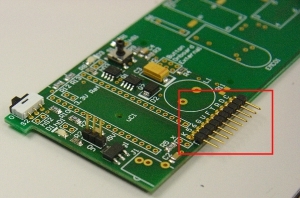 Insert it so that 2mm of the leads can be seen above the top surface of the PCB. The value of R6 depends on the output voltage of the HVPS. Please select the appropriate value below. Once you have finished the assembly of the high-voltage components, you are ready to test the high-voltage portion of the circuit. Follow these instructions. Cut the appropriate length of HV electrical cable. Manually enlarge the opening of the 2mm banana plug cover with a 3mm drill bit so it can fit over the HV cable. At the other extremity of the cable, install the connector you need for your application. We use Alligator clips as versatile connectors. Once you have finished assembling and testing (Low voltage testing, High voltage testing) your HVPS, you should place in in a safe enclosure and proceed with configuration/calibration. 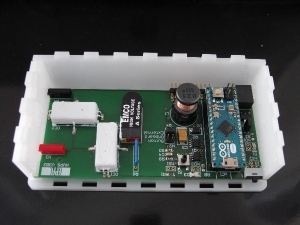 The minimal enclosure is a somewhat simpler enclosure than the full enclosure. It is therefore quicker to make and to assemble. Only the high voltage side of the circuit is protected, leaving the low-voltage side exposed, for easy access to the onboard buttons and LEDs. 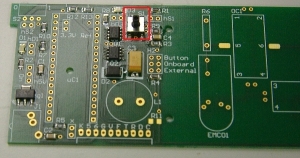 The minimal enclosure leaves the microcontroller exposed. 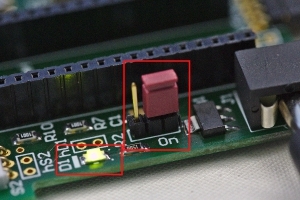 Accidentally pressing the reset button on the microcontroller while the HVPS is in use leads to the transient application of the full voltage at the output. Consequently, a reset button protection is placed on the microcontroller to avoid undesired activation of the reset button. Minimal enclosure protecting the high-voltage side of the circuit. We use a Laser Engraver Trotec Speedy 300 to cut the parts required for the enclosure, and we have prepared files ready to be cut. We also have the Solidworks 3D files, so you can use whatever method you want to cut the parts or modify the enclosure to fit your needs. 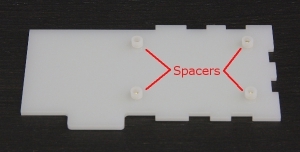 We use a 3 mm thick opaque PMMA for the main body of the enclosure. 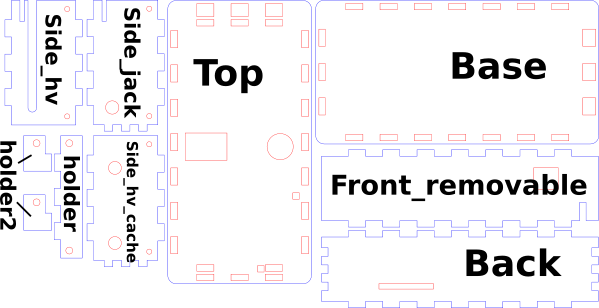 The file Download –> Enclosure Files –> minimal_enclosure.svg: contains all of the parts that need to be cut to assemble the main body. You need a plate of at least 220 mm x 100 mm to cut all the parts. We use an engravable plastic TRANSPLY-HD with a black body and a white front layer. We use the 1.5mm-thick plates. 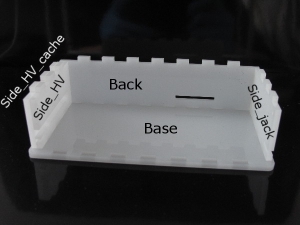 The file Download –> Enclosure Files –> minimal_enclosure_front_panel_model.svg can be used as a base for the front panel. The front panel is optional. It only provides text indication of the HVPS name and voltage rating. Start by cutting the openings before removing the protective cover on the top. The bits of molten ABS will land on the protective cover and will not stain the panel. Then remove the protective cover and proceed with the engraving step. The disadvantage with this method is that you need to precisely position the panel after cutting it so that the engraving match the geometry. But a very precise alignment is not required anyway. Start by removing the protective cover and replace it by masking tape. You can then do the three operation in one go without moving anything and in the logical order (engrave, cut red, cur blue). You must adapt the engraving parameters to go through the masking tape too. Masking tape burns without melting. This is the reason why we replace the plastic cover sheet with masking tape. Finish by removing the masking tape that will have caught the projections creating during the cutting step. Using glue for plastics (we use dichloromethane), assemble together the following parts (see picture below): Back, Front, Side (2x), Top. 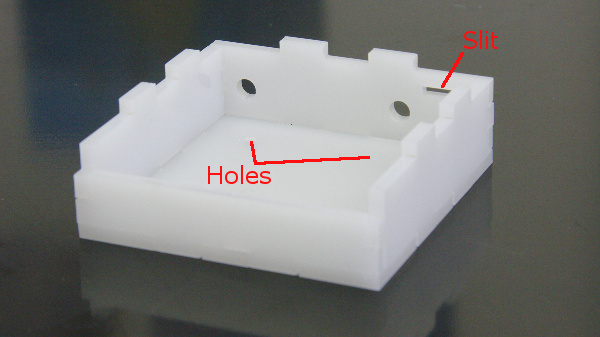 Pay attention to the position of the holes in the top part, which must be on the side of the front part. Also note the orientation of the slit in the front part, as indicated on the picture. Place double sided tape on the topside of the top part (do not cover the 2 holes), and position the engraved front panel. 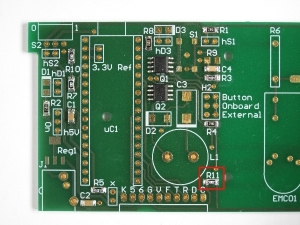 Slide the PCB into the cover, so that the PCB tab slides into the slit of the front part. 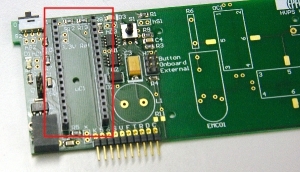 Insert the Reset protection on the ICSP header of the microcontroller to avoid undesired activation of the button. Alternatively, you can also tap the holes with a M2 thread, but you need to adapt the diameter of the holes before cutting the part. 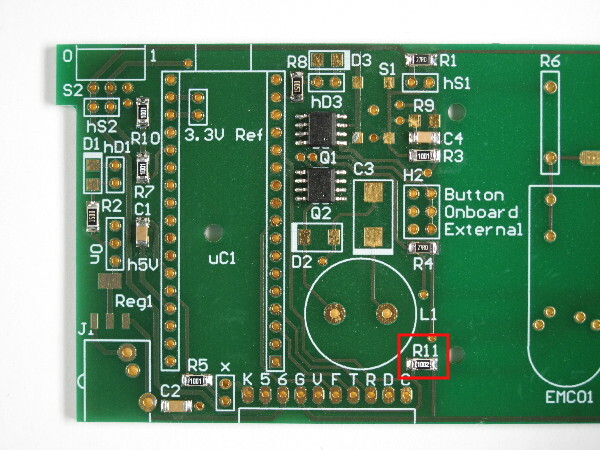 Place the PCB with the cover on top of the bottom part with spacers, and lock lock it in place with screws. You need 2 M2x6mm screw on the left, and 2 M2x20mm screws on the wight to go through the cover. To perform the automatic calibration and characterisation of the HVPS, you need some equipment: a high voltage probe (preferably a model capable of measuring dynamic signals), a NI-DAQ system, and an impedance matching circuit. The different components are described in details below. You need a HV probe to transform the high voltage output of the HVPS into a low voltage signal that can be fed to an acquisition device. The characterisation routines integrated in the GUI give the possibility to characterize the switching speed or the voltage regulation speed and stability. If you want to perform these measurements, you need to be able to measure dynamic signals. Therefore, you need a HV probe that is capable of measuring AC signals. We use a 10kV 1:1000 50MHz PR-55 probe from B&K Precision, but there are many other possibilities. HV probes designed to be used with multimeters are suitable to perform the voltage calibration, but will not work for the other tests, because they require to measure voltage steps (i.e. the probe must have a large bandwidth). You need a NI-DAQ system to acquire the analogue voltage on a computer. We use a NI USB-6212 BNC, but any system will do, as long as they have at least one analogue input. The entry-level NI USB-6000 should work fine. 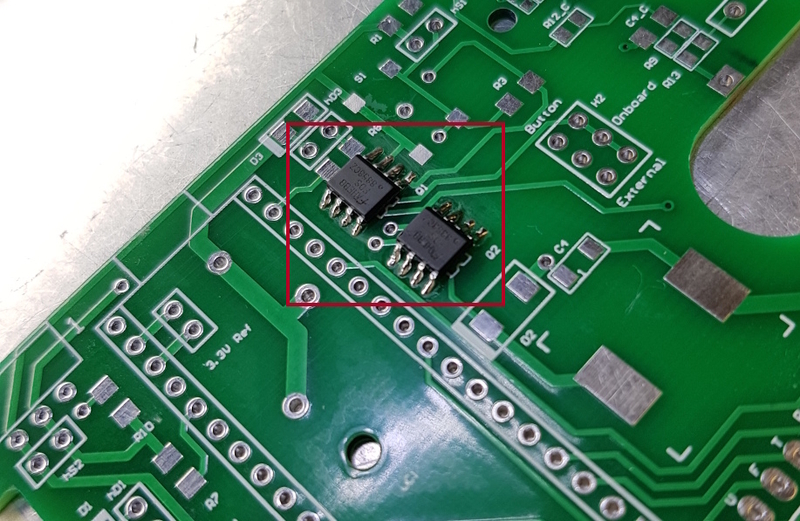 You must be sure not to exceed the voltage rating of your DAQ system when you connect the probe to it. However, NI-DAQ systems usually accept input signals in the +/- 10 V range, and HV probe commonly have a 1:1000 attenuation. Given that the HVPS with the highest rating (5kV) will output 5000 V or less, the voltage at the DAQ input will be between 0 V and 5 V, i.e. well within specification. 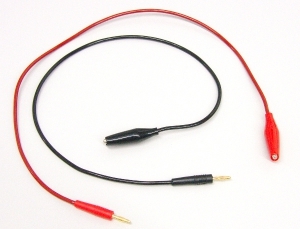 The dynamic HV probes, such as the 50MHz PR-55 we use are designed to be connected to an oscilloscope with a 1 MOhm input impedance (and if you are using a multimeter probe, it is likely designed to be connected to a multimeter with a 10 MOhm input impedance). 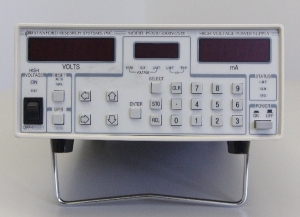 NI-DAQ systems have a an input impedance >10 GOhm. Connecting a HV probe directly to a NI-DAQ system will lead to erroneous readings. 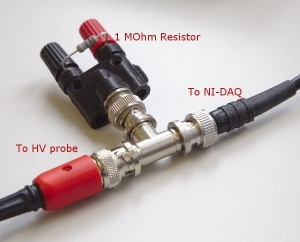 In addition, it is recommended that signals connected to a NI-DAQ system have a low source impedance, which is not the case with HV probes. You need to use an impedance matching circuit as interface between the probe and the NI-DAQ. In its simplest form, the impedance matching circuit is just a 1 MOhm resistor placed in parallel with the probe. High voltage probes have a defined attenuation ratio (most of the time 1:1000), so a calibration is not absolutely necessary. However, much better accuracy can be obtained by performing a probe calibration. To perform a probe calibration, you will need a precision HV power supply, i.e. a power supply with an output voltage that you trust as being accurate. We use a Stanford Research Systems PS350/5000V power supply for this purpose. Connect your HV probe to the precision HV power supply, and to the impedance matching circuit. Connect the impedance matching circuit to the NI-DAQ. For a set of voltages between 0 V and 5000 V (e.g. with steps of 100 V), set the HV power supply to the desired voltage value, and write down the low voltage value indicated by the NI-DAQ. 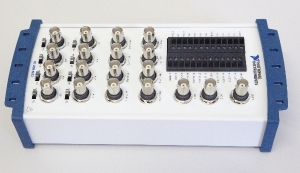 NI provides tools to directly read a channel from a NI-DAQ connected to a computer so that you can read the analogue voltage. 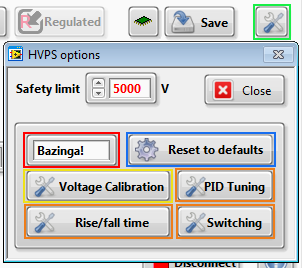 Alternatively, the HVPS interface provides the possibility to read the value of the high voltage probe from the configuration options (see screenshot). For this to work, there are two prerequisites: 1) The name of the NI-DAQ and the channel to read must be configured (see § 2.2 below), and a HVPS must be connected to the computer, or the interface main window won’t show up. The password to unlock the functions requiring the NI-DAQ is Bazinga! Plot the HV voltage value from the HV power supply (y axis) as a function of the low voltage value displayed by the NI-DAQ (x axis). 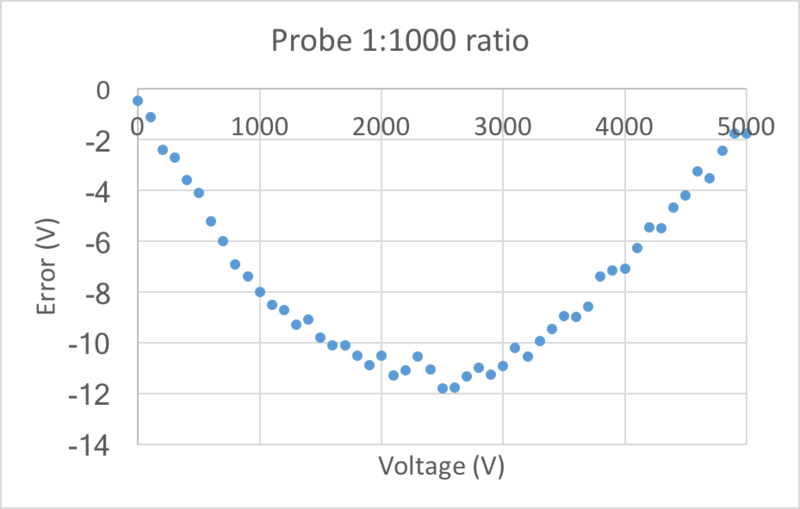 The graph below shows the error between the voltage calculated from the probe reading using the 1:1000 factor of the probe (i.e. without custom calibration). The approximation is acceptable, but there is an appreciable error, and a non-negligible average offset. 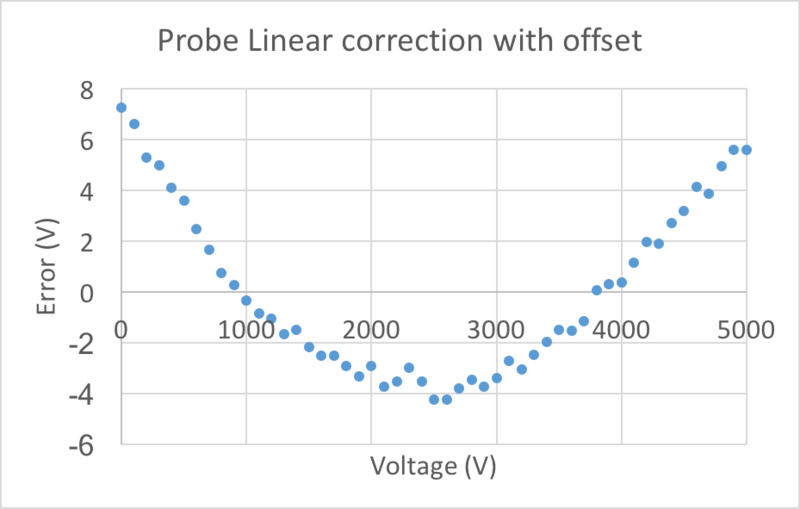 Based on the above information, a linear fit with offset, of the form y=c1 x + c0 is fitted to the data to account for the offset and a non-perfect ratio of the probe (see graph below). The error is much smaller. However, the error is not random, but takes the shape of a parabola, due to a non-linear effect of unknown origin. Consequently, we fit the curve with a generic 2nd order polynomial of the form y=c2 x^2 + c1 x + c0. The error for this fit is given below. The error is considerably smaller than for the linear correction and comprised within a 3 V band. 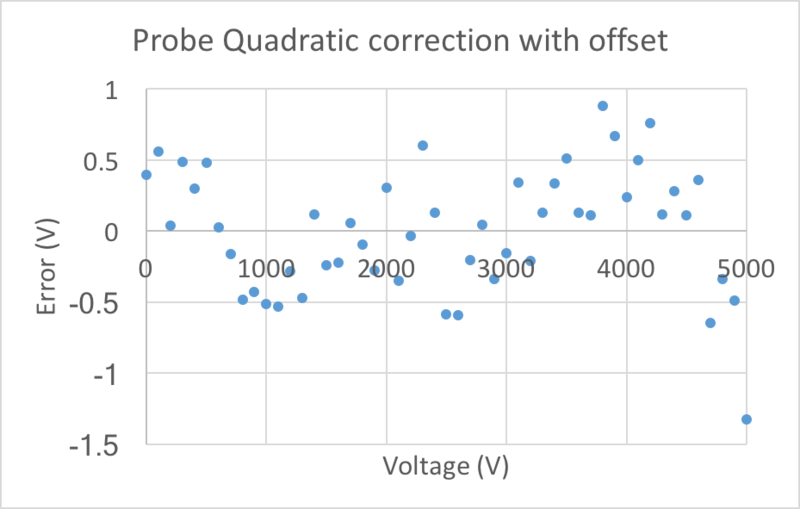 Error in V between actual voltage and voltage measured with the probe using a quadratic fit. Given the previous observations, a generic 2nd order polynomial is recommended to calibrate your HV probe/impedance matching circuit/DAQ setup. The GUI interface integrates the possibility to have 2nd order polynomial to calibrate your probe. But by setting the right coefficient to 0, you can have a simple proportional calibration if you prefer. See the following section for how to enter your calibration coefficients so that your probe can be used for the automatic calibration. To keep the HVPS interface program as compact as possible, we have only included the components that are essential to run the program from a user point of view. 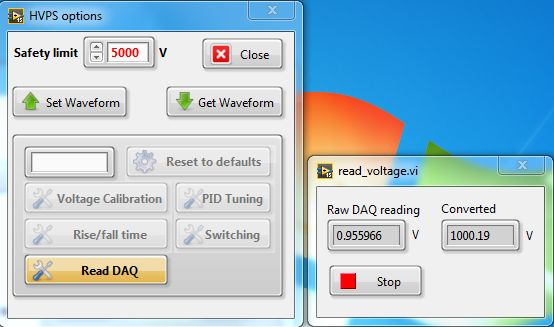 This means that the LabVIEW components required to read data from a NI-DAQ system are not included, and the automatic calibration routines won’t work on a computer on which you install the interface, unless you also install NI-DAQmx, which is the package required to control NI-DAQ systems. 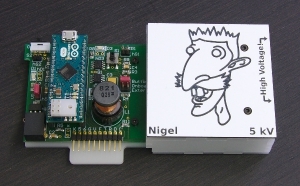 You should have received a copy of NI-DAQmx with your hardware. Else, it can be downloaded from the NI website. You will also need the report generation toolkit to generate the excel file summarizing the results. If you don’t want to calibrate your probe and want to use the ratio (e.g. 1:1000) provided by the manufacturer you can enter c0=0, c1=1000, and c2=0. If you only want a linear correction with offset, keep c2=0, etc. Important: The program is reading a differential voltage from the probe. On the NI USB-6212, this is totally transparent, because it is equipped with BNC connectors. 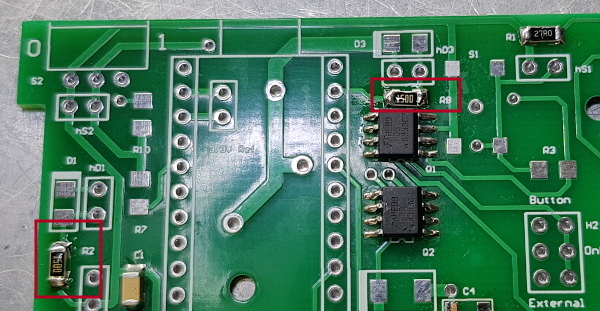 However, if you are using another unit that has screw terminals, you must connect the return signal to the input which is paired with the main signal. Refer to the manual of your NI-DAQ, but most likely, you have to add 8 to the main analogue input channel. For example, if you connect the main signal to ai0, you must connect the return signal (i.e. 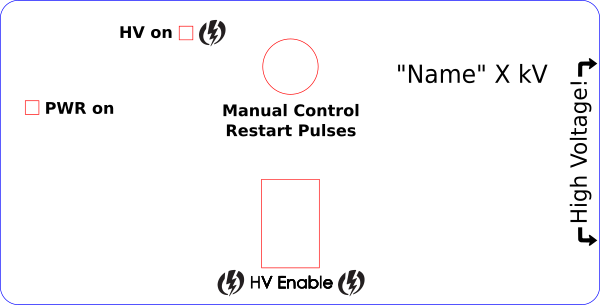 the ground of the impedance matching circuit) to ai8. Connect the HV cables to the output of the HVPS. Connect the end of the HV cables to the probe: black to the ground of the probe and red to the HV terminal. Ensure that the HV (red) contact is well insulated, doesn’t touch any equipment and can not be touched by someone. Connect the output of the impedance matching circuit to the NI-DAQ, and the NI-DAQ to your computer. The measurement file is named yymmdd_board_name_data.xls, with yymmdd the date at which the file was initially created. At the end of each measurement, the data is saved in the measurement file. If no excel file with the name of the board being tested exists in the support folder, a new file will be created and the acquired data added to the file. If a measurement file with the name of the board (irrespective of the date yymmdd) is present in the support directory, the new data will be added to this already existing file. In this case, and if the measurement being done has already been done previously, the older measurement will be overwritten by the newly acquired data. The first tab (sheet) in the excel document summarizes the test which are included in the file, so that the user can see at once what are the file contents. Move the excel file from the support directory to a location where you archive all the measurements for future reference. It is important at this stage to move (and not copy) the file, so that the support directory doesn’t contain a file with the name of the HVPS anymore. The files are generated based on an Excel template (template.xltx). The template must not be open in excel when measurements are made, or the report generation will fail. And logically, the template must not be deleted from the support directory. b) Plug in the 6V adapter. The product above is for European sockets. 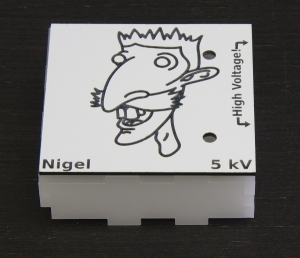 If you need a different power supply for your country, be sure it has the same voltage output, and connector (2.5mm x 5.5mm). 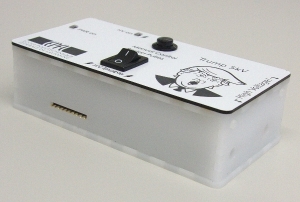 The full enclosure is a complete box that protects the SHVPS and prevents users from touching the high voltage components. 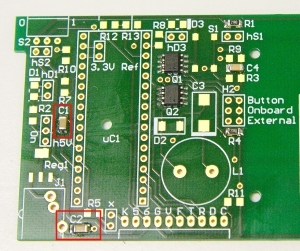 The important functions (buttons and LEDs) are placed on a front panel. 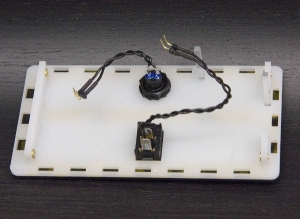 In the current versions, the onboard LEDs are used, but transparent light pipes guide the light to the front panel. The two buttons (High Voltage enable and push button) are mounted on the panel. 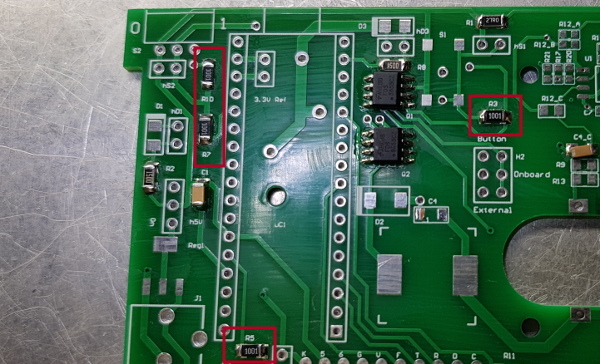 Consequently, in step 18 of the assembly instructions, it is necessary to solder header hS1 and hS2, but headers hD1 and hD3 are not required. 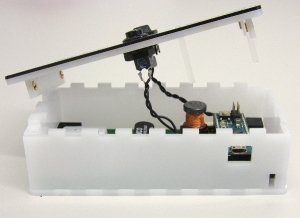 Alternatively, you can also assemble a minimal enclosure which is simpler and easier to assemble. It only covers the HV side of the circuit, and uses the onboard switches and LEDs. We use a 3 mm thick opaque PMMA for the main body of the enclosure. The file full_opaque_box.svg contains all of the parts that need to be cut to assemble the main body. You need a plate of at least 150 mm x 280 mm to cut all the parts. We use an engravable plastic TRANSPLY-HD with a black body and a white front layer. We use the 1.5mm-thick plates. You can use any other thickness value, but the length of the light pipe (see below) must be adapted accordingly. The file front_panel_model.svg can be used as a base for the front panel. 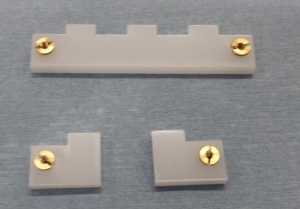 Using glue for plastics (we use dichloromethane), assemble together the following parts (see picture below): base, side_hv, side_hv_cache, side_jack and back. Base: Place the larger 3 openings on your left. 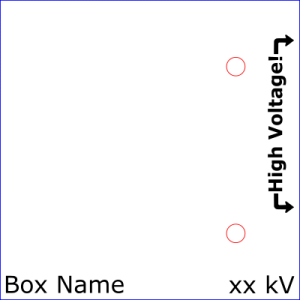 Back: The slit must be at the bottom right. Side_jack: On the right. The straight side (without slots) towards the front. Side_hv: On the inside left. The straight side (without slots) towards the front. Side_hv_cache: On the outside left. The straight side (without slots) towards the front. You can slide a HVPS to check that everything is correctly positioned. Place M2 threaded metallic inserts (Tappex Multisert – Single Thickness Head – 071M2) in the parts holder and holder2. Note: You can replace the inserts by a threaded hole. In that case, you must modify the diameter of the holes on these parts to 1.5mm prior to cutting the parts. Glue the following parts (see picture below): top, holder and the two holder2. Place top so the rectangular opening is in front of you, and the 2×3 openings on your left (see image). holder goes on the left, and the two holder2 on the right. The flanges from the inserts (not shown on the picture) should be located on the inside. Place double sided tape (or glue) on the top of the front panel. 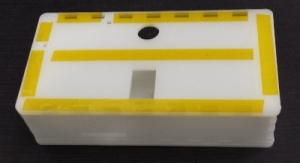 The two large openings for the two buttons, as well as the 2 small square openings for the diode lightpipes must remain free from tape. Place the engraved front panel on top of the tape-covered top part. Carefully align the two parts. It may help to first place the large switch in the engravable panel, and use it as a guide. The two lightpipes can also be used to add guiding posts to perfectly align the two pieces together. Apply pressure to fix the two parts together. If not already done so at the previous step, insert the switch in the square opening. Insert the push-button in the round opening. Insert the two light pipes in the small square openings and glue them in place from the backside. Solder wires to the the switch and push button. The wires for the switch should be 110 mm long. The wires for the push button should be 60 mm long. 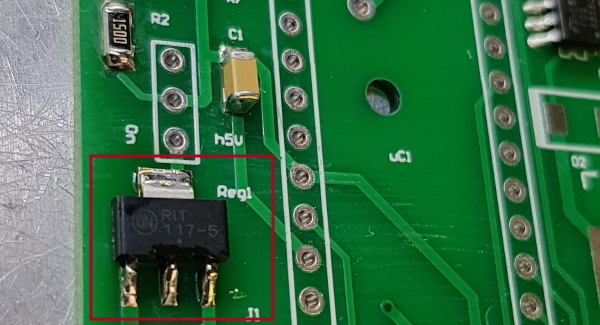 Take a wire to board connector and cut two units of two pins. Solder one unit at the extremity of each of the cables. 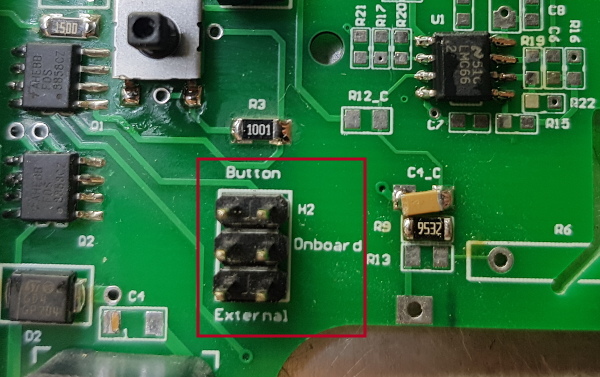 Connect the wire from the push button to header hS1. Cut the wire-to-board connector of the switch to separate the two contacts, and insert the contacts into header hS2. 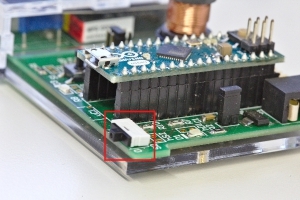 The wire from the switch should go along the Arduino and between the edge of the Arduino and the power jack in the back, as shown on the image above. 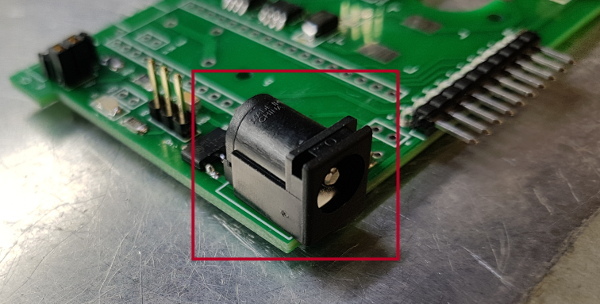 The two contacts should be inserted sideways into header hS2, as shown in picture below so that the wire doesn’t cover the onboard LED D1, or else you won’t be able to place the cover with the light pipe (see image below). Place the side panel (part front-removable). The onboard switch S2 must be in the 0 position. There is a notch in the front-removable part that prevents you from placing the part when the switch is not in the correct position. 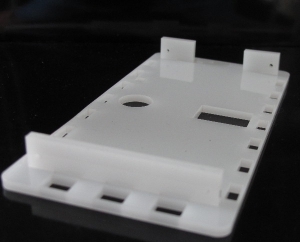 Place the front panel in place, and lock it in place with 4 plastic M2x10 screws. The testing procedure should be printed, marked and added to the other testing documents. 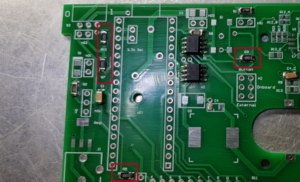 Report the name and I2C address from the low-voltage test sheet. 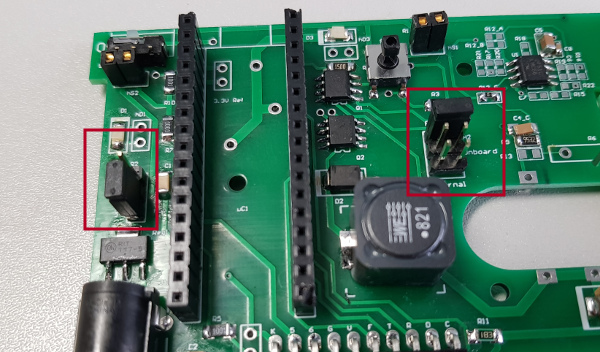 Take a Arduino micro, but do not install it on the HVPS PCB. Program the Arduino with the Send_PWM program. In Arduino GUI, open the Serial Monitor. 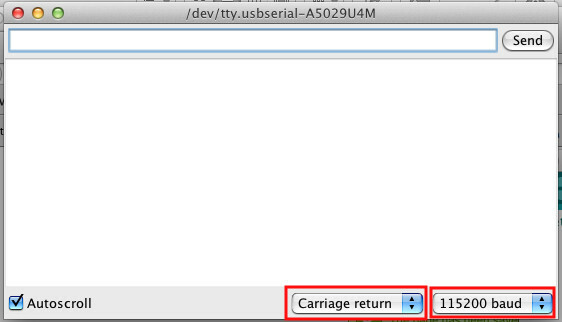 Set the termination character to “Carriage return” and the transmission speed to “115200” in the 2 dropdown lists. Close serial monitor, and unplug the USB cable from the Arduino. 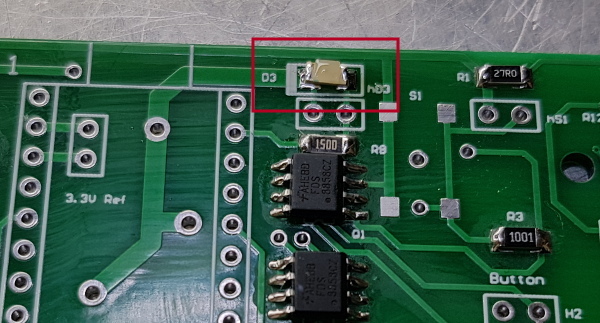 Be Careful when testing the high voltage part of the circuit, as the board is not yet in a protective enclosure. High voltage will be present at the output and on some of the components during the testing of steps 6 and 7. 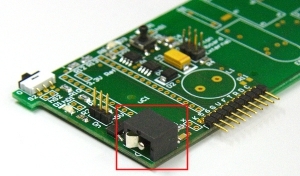 It is important not to touch any part of the SHVPS during this test, and to place the PCB on a well-insulated surface. ☐ ADC Read is smaller than 10. If not, try step 8 once again. If the board is assembled at EPFL-LMTS, Fill columns A to H in the Excel database of assembled boards (HVPS-dev\Slave\ Assembled_SHVPS_database.xlsx). 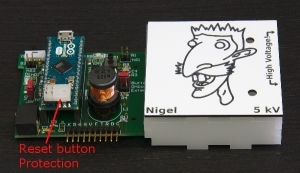 Names and address are not yet stored in the micro-controller, this is normal. 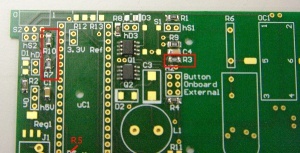 Place a sticker at the back of the PCB indicating: Board name, maximal voltage, and I2C address. 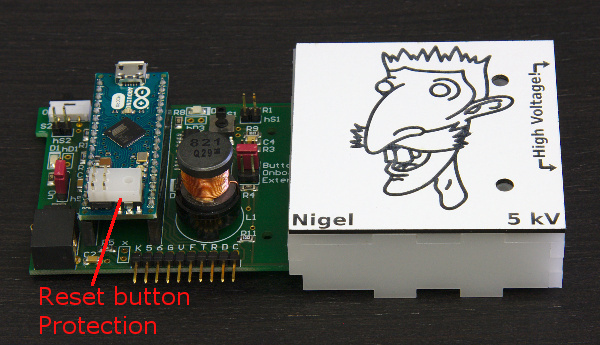 Name and address will be stored at a later stage in the micro-controller. Use the name and address you have defined at the top of this test sheet. 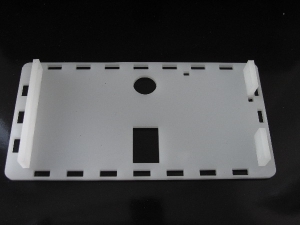 Continue with the calibration of the board, and the fabrication of the enclosure. Solder capacitors C1 and C2. Polarity is not important. Solder capacitor C4. Polarity is not important. Solder resistors R2 and R8. Polarity is not important. Note that R8 is vertical; do not solder it on the pad D3.